Here at Literature Works we love literature which focuses on place. 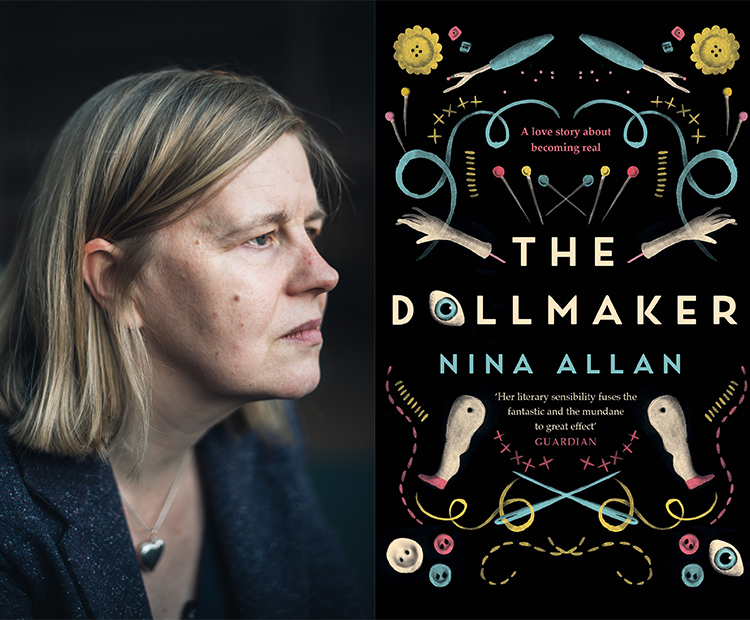 That's why we we were pleased to receive a review copy of Nina Allan's latest novel, The Dollmaker. We review the novel and catch up with Nina here. Fairy tales seem to be enjoying a resurgence in popularity at the moment and it’s not difficult to see why. By their definition, fairy tales are predisposed to offer escapism and notions of wish fulfilment that can provide welcome relief from ‘real life’. Enter, then, the latest novel from Nina Allen, a work of literary fiction entitled The Dollmaker. Here is the tale of Andrew, an artisan doll maker and Bramber, whom he comes to know by responding to a request for information she places in a collector’s magazine. Both of these characters are proven to be unique and somewhat ‘other’ to society and they are united by their mutual appreciation for dolls and a certain thinly veiled need to escape their respective situations. Daring to do something bold, Andrew decides to set out to find Bramber, whose letters entice him to think that she is in need of rescue and so he sets out. Leaving his home behind and travelling across the south west of England, Andrew resolves to find Bramber guided only by her mysterious address. On his journey across the region, Andrew discovers some strange little towns and villages which lend to the eerie undertones in the plot. As a regional agency, we love writing that focuses on place and we really think that the sleepy towns and open moorland of the novel’s landscape really build a sense of unease and oddness for the reader which is inherent to the novel’s plot. We also loved the notion of subverting the fairy tale, of using it to reveal more about the modern day story and to reflect life and opinions back on to the reader. A compulsively unsettling story and hypnotic prose make this a must read for April! The Dollmaker is out now, published by riverrun, an imprint of Quercus. The Dollmaker brings inanimate objects to the forefront, using the notion of both the characters’ and readers’ fears to create a tension which is both thrilling and uneasy. What sparked you interest in dolls as a central theme in this novel? I went through a phase of making my own rag dolls – all the stuff about Andrew and Ursula visiting jumble sales and charity shops in search of interesting fabrics is drawn from life, pretty much – and I have always loved and been fascinated by the creative processes involved in manufacturing antique dolls. I am not someone who believes that inanimate objects have a soul but I do firmly believe that objects are repositories of memory, especially objects – like dolls – that were once precious to someone. As such they form the perfect inspiration for stories – stories that will hopefully resonate with readers, because of the memories they spark off in turn. Both protagonists are considered ‘different’ by the societies they occupy for varying reasons which are slowly revealed to the reader. What is it about dolls that brings them together? Andrew and Bramber both respond to the idea of dolls as lonely or abandoned, strangers in a strange land – which mirrors how each of them feels about themselves. Andrew first catches sight of Marina Blue in a shop window – she’s on show, she’s exposed, and Andrew instinctively feels he wants to be with her, he wants to understand her. Similarly, Bramber first encounters a doll when she is at the house of one of her mother’s friends – the two adults are talking and Bramber feels sidelined and ignored. When she sees the doll – abandoned in a spare room – she feels an instant frisson of recognition. Andrew becomes famous for his ‘troll dolls’ – dolls that are deliberately not perfect, that subvert the very notion of the words ‘doll-like’. Bramber loves Ewa Chaplin’s dolls at least in part because they are emblematic of alienation and difference. The sense that dolls are part of another world, complete unto itself and independent of the conventional human world – a world that often makes life difficult for people like Andrew and Bramber – is a strong part of why they feel attracted to dolls, and to each other. The novel features the fairytales of Ewa Chaplin – dark and foreboding vignettes which creep into the mind of the reader and provide interesting meta-theatrical elements for both the characters and which seem to provide wider social commentary. In fact, they reminded me very much of the work of Angela Carter. Would you say that you were inspired by her with this element and what function do you see the stories serving in the plot? It is impossible not to be inspired by Angela Carter – people rightly talk about her influence as a feminist writer but for me she is equally important as a writer of imaginative fiction. She brought a wonderful freedom to her practice – a sense of not giving a damn about conventional ‘literary’ subjects or modes of expression and just going all out for what felt right and essential to her. Only recently I discovered a play of hers, Come Unto These Yellow Sands, about the Victorian fairy painter Richard Dadd, which contains some of the best, most understanding writing about Dadd’s schizophrenia that I have ever encountered. Angela Carter is the writer readers have mentioned to me most often in the context of The Dollmaker, but if I am being honest I would have to say that she is a background inspiration only, that I did not think about The Bloody Chamber until people began asking me about it! Perhaps unexpectedly, the book’s more conscious inspirations came from art – the paintings of court dwarfs especially by Velazquez – and music – the Schubert song ‘The Dwarf’ and Zemlinsky’s opera The Dwarf, which was in turn inspired by Oscar Wilde’s fairy tale The Birthday of the Infanta. Social commentary is most definitely a key function of the Ewa Chaplin stories within the text. Most of all I wanted to subvert the negative roles of people with dwarfism as they have previously been portrayed within traditional fairy tales, to present a much more ambiguous, nuanced series of ideas that lead off on interesting tangents. I also wanted the stories to be thrilling and dangerous purely as stories – which of course brings us neatly back to Angela Carter! It’s fascinating to see such a strong interest in fairy tales and myths among writers today – I’m thinking of Kelly Link’s stories, and Kirsty Logan’s stories. If I had to name one book that inspired me to push The Dollmaker as far as it would go it would probably be Helen Oyeyemi’s story collection What Is Not Yours Is Not Yours. I found this book deeply perplexing when I first read it – but as time goes on I keep returning to it with greater and greater admiration. As the region’s literature development agency, we love work which makes use of the landscapes we’re surrounded by. What inspired your decision to set a large part of the novel in the south west? I lived in the West Country – Exeter and North Devon – for eighteen years. My mother lived in Cornwall – in and near Falmouth – for more than twenty. It’s a region I know well and love dearly. More, it is also the region in which I first began writing seriously for publication. I first had the idea for The Dollmaker more than a decade ago, when I was still living and working in Exeter. Place is deeply important to me – I think it would be true to say it influences everything I write – and so when I began writing a rough draft of what would eventually become The Dollmaker it felt not just natural but necessary to include the landscapes that were a part of my daily reality, both in a physical and imaginative sense. I have taken certain liberties with them, of course – Cornwall becomes weirder and more estranging the further west Andrew travels – but I hope West Country readers in particular will enjoy sorting out the fiction from the reality! It is wonderful to see new writers emerging who cite the West Country as a grounding influence. In recent years I have especially enjoyed and admired the work of Lucy Wood, Wyl Menmuir and Natasha Carthew. We like to ask writers what a ‘writing day’ looks like for them. Can you describe yours for us? Is there a piece of advice that you could offer to emerging writers in the genre of literary fiction? I’m usually at my desk by nine. I spend the first hour catching up on news/surfing the internet/seeing what new literary scandals have erupted overnight. This time is actually very useful – I’m thinking about the day and the work ahead, often making notes or saving articles for further reference later. I then progress to answering emails and completing work – such as this interview! – that does not form part of my fiction writing but is nonetheless important and intimately connected with it. I hope to have most of my administrative tasks complete by around eleven-thirty, so I can pick up from where I left off on my current fiction project. My optimum time for actual writing is after lunch – two o’clock until five o’clock. This is when I would hope to get the majority of my daily word count done and dusted. Evenings are for research, reading, and of course cop shows! 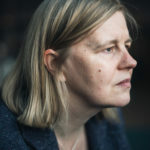 I hasten to add that all writers are different and what works for me might sound like madness to someone else – most of my partner’s writing gets done between eight pm and eleven pm. I feel very lucky in that I am now able to write full time, but it was not always this way – I wrote all the early drafts of The Dollmaker when I was still doing a nine-to-five job – and I would absolutely stress that writing will adapt itself to any schedule. Even if you are only able to sit with your work for an hour a day – or every other day – you can still achieve your ambitions. Day jobs breed ideas. I am almost entirely the writer I am today – directly or indirectly – because of my day jobs. The one piece of advice I always pass on is to read – and to read above your level. Seek out work that not only challenges you, but that you feel helpless before, by writers you know are better than you and who you feel you have no hope of emulating. It is only by pushing at these kinds of boundaries that we begin to achieve. My greatest teachers have always been and always will be other writers – usually not in person, but on the page. Feeling that thrill of discovery, of fear, is one of my greatest pleasures as a writer.